Dunster, in Somerset, is a quaint old medieval English village in a country setting. As the best-preserved medieval village in England it punches well above its weight for interesting heritage features. There’s an ancient castle, a watermill, the stunning Old Yarn Market built in 1609, and a C16th tithe barn. The ancient eight-gabled Yarn Market shows the importance of the wool trade to the region in the C17th. The village has 200 listed buildings, and of course shops, cafes and pubs and hotels. The train station is at the end of the West Somerset Railway, the longest heritage railway line in the country. There’s a booking office and tickets are printed on the printing press previously used by British Rail. The station is about a 20 minute walk “with a slight incline from the village”. It is also five minutes walk from the beach where there is a sunken area of land which was the medieval port of Dunster. There have been watermills in Dunster since records began with the Domesday Book, when there were two corn mills. The watermill we see today dates from 1779 when it powered the cloth trade. As with other watermills, this one fell into disuse, but the mill found new life and ground flour in The Second World War. The mill itself is rare type as it is a double overshot. There are two wheels driven by water which falls on the wheels in turn from above. Overshot watermills were an advance in the early industrial revolution. They proved to be twice as efficient as the paddle or undershot mills. Now in full working order, it grinds organic flour for sale at the watermill and in the stables shop. Currently it produces stoneground wholemeal flour from organic wheat, the mill is in action on the first Wednesday of every month. The tea room provides refreshment from a cup of tea to a hearty lunch. Other historic buildings in the town include the medieval dovecote with 4ft thick walls. While, on the edge of the village is the old pack horse bridge. The National Trust owns the thousand-years-old Dunster Castle. Dramatically sited on a wooded hill, the castle dates back to Norman times. It has an impressive medieval gatehouse and ruined tower giving a reminder of its turbulent history, it resisted siege twice. Its hilltop site has spectacular views over the Somerset landscape. Inside, visitors will enjoy the subtropical gardens. 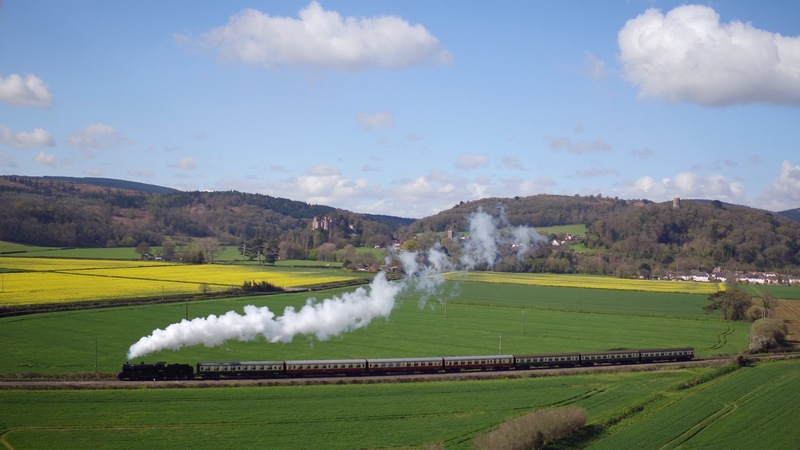 Travel here in style on the Dunster Castle Express. Dunster also boasts a doll museum with thousands of dolls from a wide range of places and times. After the V&A the Museum has the largest collection of dolls in the country. A popular addition to Dunster’s repertoire is the Yarn Market Hotel’s programme of Choral Weekends. These provide a weekend of Choral singing under the direction of Ian Chesworth; who many will recall from Sing While you Work. Additionally, Dunster Music Festival combines a wonderful musical experience with a break in the best-preserved medieval village n England. If you have enjoyed a visit to Dunster please tell us what you enjoyed about it.